Mesong Fire and Safety Equipment offers a range of fire extinguishers, safety equipment and fire safety services in South Africa. The company has a team of qualified fire prevention technicians that is trained to service all Mesong products and carry out safety inspections, to ensure that each customer’s equipment is in order and performing well. Mesong values the safety of people and strives to educate and promote fire safety. The company provides free basic training for all Mesong products as part of the standard service. Mesong Fire and Safety Equipment is a SABS and SAQCC accredited enterprise that brings safety and security to clients. If discovered in the early stages, a fire can be extinguished quickly if the correct fire extinguisher is available and used. It also helps if the person operating the extinguisher has been trained to use it properly. Fire extinguishers are classified according to the type of fire they can extinguish. 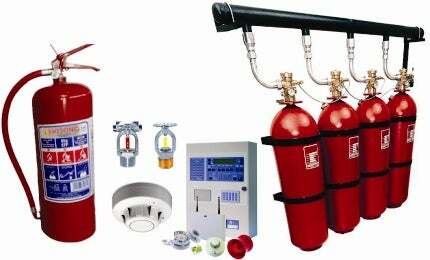 Mesong Fire and Safety Equipment supplies, installs and maintains portable fire extinguishers of all classes i.e. Class A, B, C, D and K.
Fire detection and suppression systems are essential to numerous industries, as they help control damage and loss to equipment. A common means of detection is through the use of heat sensors, wiring, or manual detection. Mesong Fire and Safety Equipment has expertise in the design and installation of special fire hazard technology and industrial fire protection systems, including the latest in fire alarm and fire detection systems. The company is a member of the FDIA. A fire sprinkler system is an active fire protection measure, consisting of a water supply system that provides adequate pressure and flow rate to a water distribution piping system that fire sprinklers are connected to. Historically, sprinkler systems have only been used in factories and large commercial buildings, but systems suitable for homes and small buildings are available at a cost-effective price. Mesong Fire and Safety Equipment is ASIB approved. The company offers solutions designed to accommodate the numerous challenges encountered in industrial boilers. Mesong Fire and Safety Equipment aims to deliver high-quality, cost-effective designs to promote fire safety measures. The company has an in-house production team that carries out the sign printing.